Studio Jules Art - Blog: Qult Labels Finished! 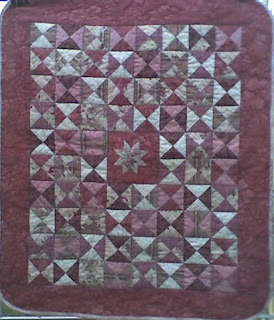 This is the sweet miniature quilt I made three years ago for a church auction. One of my friends bought it and I just now made the label for it and put it on! Time flies! I finished the labels for the quilts I made my little Hudson too. Glad to get those "little things" off my "To Do" list. Now that I have my errands run, labels stitched on quilts and laundry in the works, I'm going to cover a couple of sketch pads and journals. I need a fun, learning project today. Reward myself for my weekly accomplishments! I'll show you the results when I'm done! Have a sunshine day! I know the feeling. I still have aquilt waiting for a label.My friend makes beautifully embroidered labels left blank in the middle. Joan, what a great idea! I always embroider all of my labels, but I may try the embroider ahead of time method! It may save some time in the long run! Thanks for the idea!